PERFECT spring weather provided the ideal setting for Singleton’s first Art Bazaar. The event organised by the Hunter Arts Network HAN) was held last Sunday on the Civic Green. It attracted 50 stallholders offering a variety of arts and crafts and food supplied by members of Hunter Valley Slow Food. Locals enjoyed the chance to stroll around chatting to the various artists. One of the main attractions of the event is the fact visitors are able to talk to the artists directly about their work and buy directly from the people that produce the works. 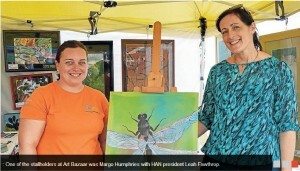 Art Bazaar has been in existence for more than a decade and travels around the region to different centres. Given the success of the Singleton event its is hoped it will be a regular feature on Singleton’s arts calendar. The Summer Art Bazaar will be held at Civic Park in Newcastle on Saturday December 7. It is being promoted as provided the ideal venue for Christmas gifts.